Featuring free Wi-Fi and a rooftop swimming pool with city views of Bangkok, King Royal Garden Inn is just a short stroll from Surasak BTS Skytrain Station on Sathorn Road. 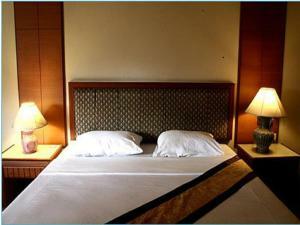 The air-conditioned rooms come with a seating area, cable TV, and a safety deposit box. Tea/coffee making facilities and a fridge are also provided. The en suite bathroom has a bathtub and shower. King Royal Garden Inn is just one Skytrain station away from the Chao Phraya River, and a 10-minute Skytrain journey from Siam Square. Silom Centre is a 5-minute drive away. Guests can enjoy a relaxing massage, or exercise in the fitness centre. 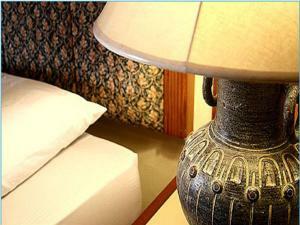 The 24-hour front desk offers luggage storage and laundry services. A food court on the ground floor serves Thai dishes, light meals, and beverages on weekdays. Guests can also find several local and international restaurants within a 10-minute walk of the hotel. 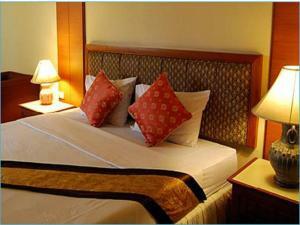 This room features cable TV, a safety deposit box, and tea/coffee making facilities. The en suite bathroom has a bathtub and shower. 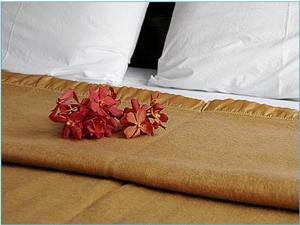 Rate: THB 1000.00 ... THB 1100.00; select dates below to get current rates.